Road intersections cover large area which can be difficult to entirely monitor. In recent years, unmanned aerial vehicles (UAV) for traffic monitoring and traffic data collection are used because of their ability to cover such large area. A generic and robust approach to detection and tracking of road vehicles from aerial video sequences is an important goal of the fully autonomous UAV systems for traffic monitoring. 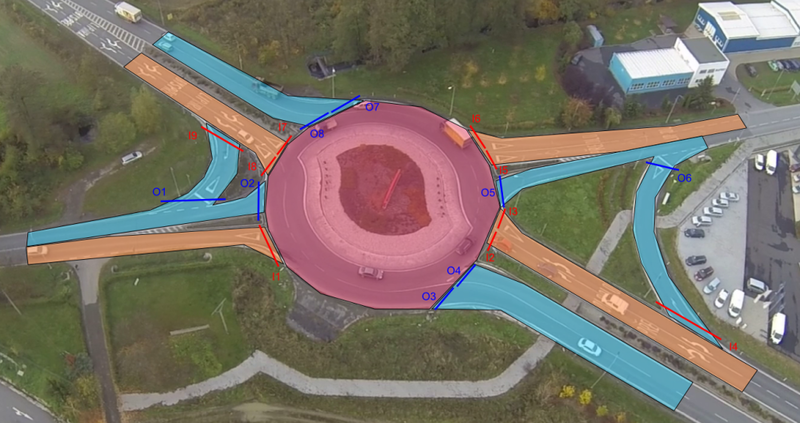 For one of our partners, we developed and implemented a system for automatic visual inspection of traffic activities at intersections from data acquired by a low-cost UAV. Traffic flow at intersections is very dynamic and requires continuous and accurate monitoring for further analysis. Deploying fixed, wired camera systems or other conventional systems for counting and tracking vehicles over the wider range demands typically massive investment. Alternatively, UAVs can be converted to very agile and responsive mobile sensing devices which can operate fully autonomously and provide detailed data in sufficient quantity. For this reason a small UAV system equipped with camera recording device could be the most effective choice for data acquisition. The objective of our work is automatic detection of road users, their tracking during the passage through the intersection, identification of input and output gates used by the tracked vehicle, speed measuring, etc. The visual data for analysis is taken by the UAV which operates in flying height about one hundred meters above the intersection. The UAV is equipped with camera recording device which can be controlled remotely. The gathered data is processed and detailed report is generated. In case of interest, please feel free to contact us at info@rcesystems.cz or see www.datafromsky.com. © 2018 RCE systems. All Rights Reserved.